A favourite flower for Mothers day, Chrysanthemum flowers are actually not difficult to grow plants and even easier to care for. The flowering season is from late summer through to autumn, depending on the variety and climate zone. Plants are available for sale as potted specimens from spring onwards, however most appear in nurseries when in flower. Cuttings are available from Summer to Autumn. 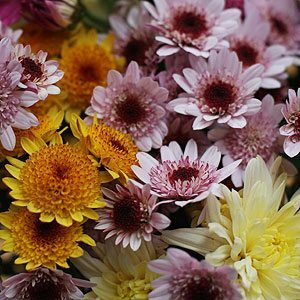 Chrysanthemums are one of the easiest free flowering plants that you can grow in your garden. They do require water and do like a humus rich soil. If you can provide these two elements you are well on the way to being rewarded with masses of flowers in late summer to autumn. We have a few other tips as well. One of the best ways to grow these colourful plants is by using a drip irrigation system. And this can work with plants grown in containers as well as those grown in the ground. Drip irrigation reduces the likelihood of fungal diseases, as does providing good air flow to lower the humidity. To get those large exhibition style blooms you will also need to stake the plants, or you can use a wire or mesh grid is too are growing large quantities. Fertilise with a high nitrogen fertiliser up until the buds appear, after this use a low nitrogen fertiliser similar to tomato fertiliser. Choose a sunny position with some afternoon shade in warmer areas. Prepare the soil well by digging in compost and well retted cow manure. Install a support system or stake the chrysanthemums. Fertilise through the growth cycle. Chrysanthemums come in a number of types, annual (Xanthophthalmum) and perennial. They all prefer a humus rich well drained bur moist soil, taller growing varieties will need staking. As proven by florists all over the world they make great cut flowers and they come in a range of colours. The variety to look for is Dendranthema x grandiflora this is the florists type, but often called the ‘Hardy Mum’. It is a perennial, so you can grow it year after year, low growing to around 15 cm until the flowers appear then it will reach nearly twice that height with flowers ranging from white and pink through to red and even brown. Simple alternate lobed ovate leaves and flowering both in spring and autumn. The flower colour, and this includes variations such as light and deep. Colours include White, Cream, Pink, Red , Bonze, Purple, Red, Yellow, Salmon. Flower type, this is to do with the flower shape or more correctly how the petals are arranged, such as Reflexed or Incurved. Your local Chrysanthemum Society can provide more details on this system. In good sun and a well drained humus rich fertile soil what we call ‘Hardy Mums’ are a type of Chrysanthemums are relatively disease free. 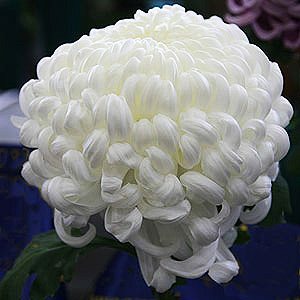 Firstly these are actually a fairly tough plant, great survivors, they will perform and flower more freely in good conditions, however it is very easy to grow chrysanthemum flowers. The potted plants purchased for Mothers Day can be planted outside and they do well in cool to temperate climates. Provide chrysanthemum plants with some protection from the afternoon sun, and a free draining soil. It is best to water the soil rather rather the plant, this helps prevent disease. Dig in lots of well rotted compost before planting. As the plants begin to grow in spring prune back the shoots without flower buds to about 15cm, this keeps the plants strong and bushy rather than the natural sprawling habit. Deadhead spent flowers as needed. Many gardeners like to ‘pinch out chyrsanthemums’ to make the plants bushier or for larger ‘ exhibition’ type blooms. Fertilise with a seaweed liquid fertiliser during the growing period. Established plants can be divided every year when dormant, remove the new outer shoots and replant, the older core can usually be discarded. Cuttings can also be taken. And that pot of Chrysanthemums that you brought for mum, can you plant it in the garden ? Yes you can, and with a little care it will thrive. Button types (pictured right) are popular as cut flowers. All are easy to grow but most types need staking. Melbourne Show – First weekend in May. Burwood Heights Uniting Church.